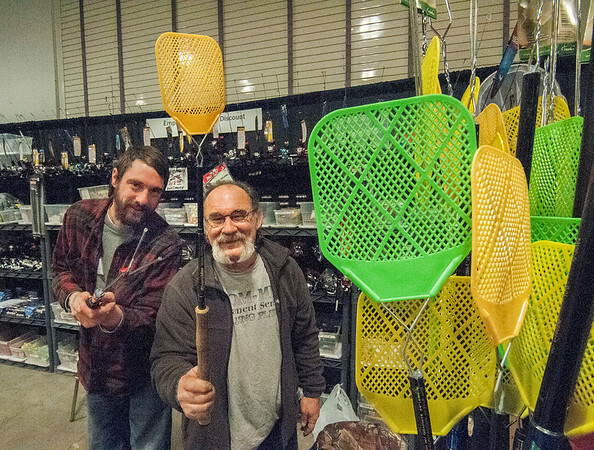 Niagara Falls, NY - Armand Roger and Duane Hofert, with Empress Charter & Discount Tackle, from Wilson, show off flyswatter and marshmallow fork repurposed fishing rods at the Greater Niagara Fishing & Outdoor Expo at the Conference & Event Center Niagara Falls. Organizers said there is something for everyone including food, retail areas and a family fun zone. For more information visit http://www.NiagaraFashingExpo.com.